Black Eyed Susan Rudbeckia Hirta is a herbaceous perennial plant native to the United States. Black Eyed Susan seeds germinate in 2-3 weeks, and this popular garden flower is often planted as a short lived perennial or biennial. 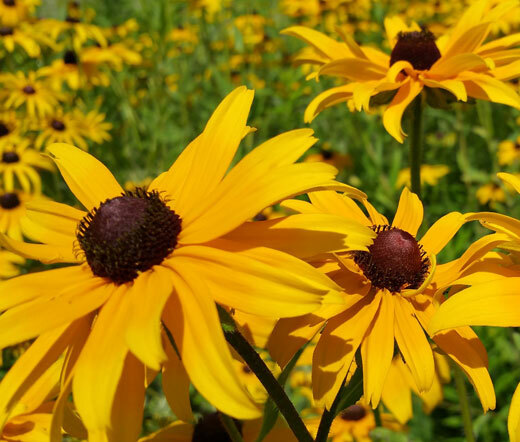 Rudbeckia Hirta is most easily recognized by its yellow, daisy-like flowers with a brownish-purple center. The Black Eyed Susan features strong, leafy, upright stems, and its showy flowers are two to three inches in diameter. Rudbeckia Hirta is a good summertime bloomer that attracts butterflies and bees. Black Eyed Susan grows perfectly in cottage and cutting gardens, borders and various flower beds. Rudbeckia Hirta seeds are very small; therefore, the surface sowing applies, and the seeds can be simply broadcasted over the desired area and pressed or roll ed into loosened soil. Rudbeckia Hirta enjoys full sun and grows well in virtually any soil from sand to clay. Black Eyed Susan makes a superb cut flower which has a vase life of 6 to 10 days.